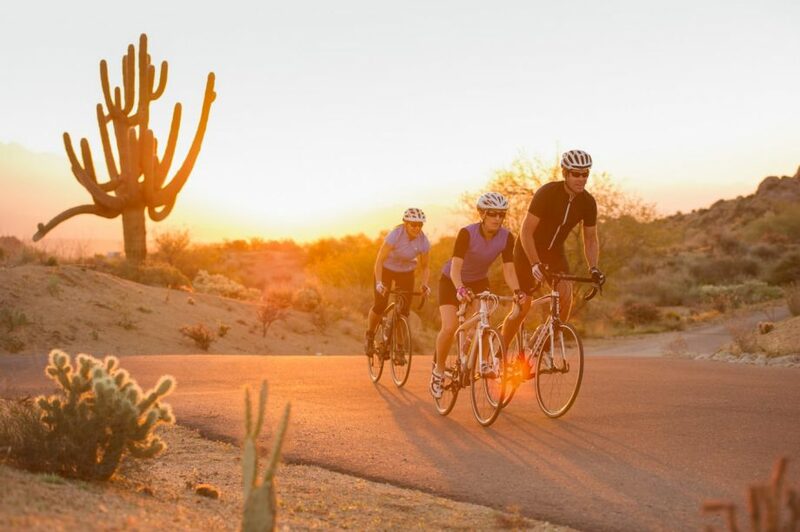 With over 300 days of sunshine and incredible scenery, Scottsdale is perfect for exhilarating road cycling, including long scenic rides and challenging climbs to beautiful desert views. 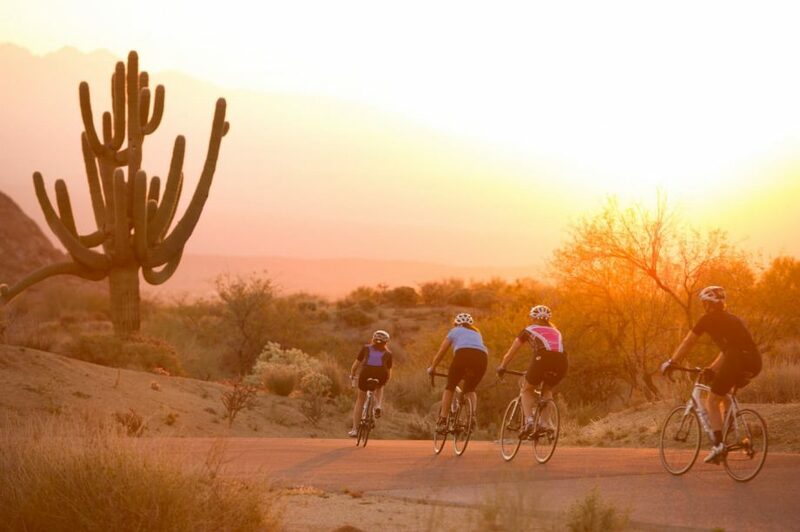 This cycling trip through the Sonoran Desert around Scottsdale and Cave Creek, Arizona, is tailored to each traveler and incorporates the best cycling routes in the area, offering daily lengths from 28-68+ miles. Available November 1 – April 15. No solo travelers, this option is for a single room while traveling with your group. This tour is available November 1 – April 15 upon request. This self-guided road bike trip is perfect for the casual road biker, the visiting triathlete looking for winter miles, or the avid cyclist. Over five days you’ll have the opportunity to ride the best routes in the Valley by day and relax by night in comfortable hotel accommodations. Choose a road bike from our top-notch rental fleet, let us know your pedal requirements and the type of rides you are looking for and we will help tailor the trip to you. 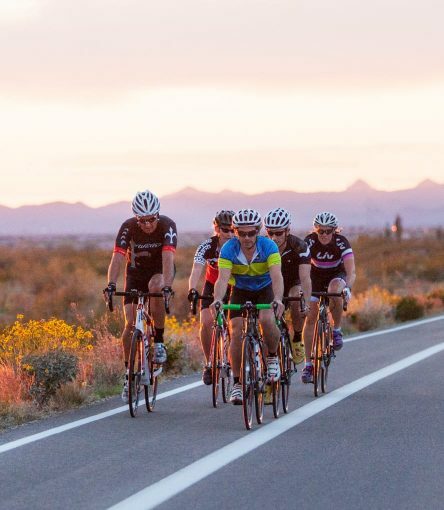 When your road cycling vacation is nearing its end, you may convince yourself that Scottsdale would make a great second home for the winter. 12:00pm, Upon arrival at the AOA/Pure Adventures rental and tour center in Scottsdale, one of our experts will review your Route Book and resort reservations in detail. After getting to know you and the cycling tour you are looking for, they may suggest customized rides or activities to enhance your week. AOA will then provide a brief bike setup and collect your luggage (changing room available) before you set off on a classic local’s ride to the charming town of Carefree, AZ. When you arrive at your resort you will find your luggage waiting for you at the bell stand. Enjoy your first night relaxing, watching a phenomenal Arizona sunset over dinner on the hotel’s patio or at one of AOA’s restaurant recommendations. Get ready for one of the most beautiful and most challenging rides of the program. This ride takes you northeast into the wild Sonoran Desert to destination you may not expect: a lake! In a few brief pedal strokes, you will find yourself away from the sounds of civilization, ascending over a cactus-laden hill into a wide ravine shadowed by towering giant saguaros. Watch out for Whiptail Lizards scampering off the roadside as you negotiate the high speed descents. What goes down, must come… ready to tackle a few climbs. Once you arrive at Bartlett Lake, head to Rattlesnake Cove for a refreshing swim or simply refuel at the Marina shop. If you are still craving a challenge, not a problem! Today is a great day to extend your ride and AOA knows all of the nearby extended route options. Don’t burn all of your energy though, because tonight is a great opportunity to let loose with the cowboys in nearby Cave Creek. There are two options available for today. For those seeking a longer, more challenging day, head out “around the mountain” on a 67-mile route with 3,300 feet of elevation gain. 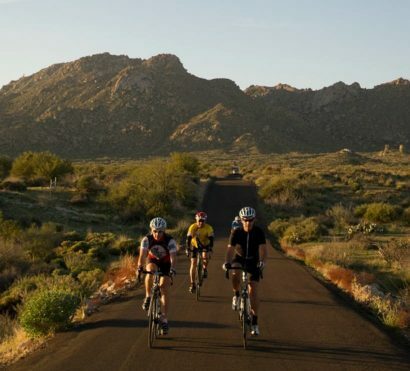 This route will go around the McDowell Mountains through Fountain Hills offering an amazing view over Four Peaks Wilderness area, the Verde River Valley, including a nice 9 mile downhill section to give you a break. For those seeking something short and sweet, we recommend riding to the Toms Thumb Trailhead and back to your resort. Closer to 30 miles round trip, this option allows for a section of hiking, too, if you want to bring along hiking shoes in a backpack. The Toms Thumb trail is a spectacular hike high above the Phoenix metro area which offers views in all directions for many miles. For the afternoon, save time for spa services or soaking in the pools back at the resort! Today you will head westward to ride some sections that are popular with the local roadies along with older, classic routes. Today is all about the miles. During the ride you will see some of the suburban and rural coming together as the city encroaches on the rural ranches and former homesteads of this wild west region. Nearby Cave Creek is a combination of town and country, biker and cowboy and many artists- the ambiance eclectic and unique. We can add or subtract miles to today’s ride, according to your goals. Today is departure day! We include a luggage transfer back to our offices so you can get one last ride in before departing. The ride is mostly downhill into Scottsdale, but we mix in a few climbs and opportunities to enjoy the Sonoran Desert scenery along the way. Upon arrival back at the AOA/Pure Adventures rental and tour center you may change clothes and gather your things for departure.